With prices for some bottles of French Bordeaux getting so much press as their prices crest a thousand dollars plus per bottle, is it any wonder many Americans avoid those aisles in the wine shops? Even those who may ask for a Cote du Rhone (nothing wrong with that) have taken to American red-blends (nothing wrong there either). But for those who have never tasted Bordeaux, quelle dommage! Having enjoyed French Bordeaux in 1969-1972, I could scoop up Lafite-Rothschild, Latour, Mouton Rothschild, Margaux and Petrus for less than the price of some premium cigars today. Quelle dommage indeed! French blending is different. Blame it on terroir. Blame it on old world style. Blame it on French oak if that makes you feel better, but while you may debate whether this aspect or that is better, no wine lover can deny that it is different. And, as the French say, vive la difference because it is the many differences in wine grapes and wine making and soil and climate and so many other things that make tasting wine so enjoyable. So while Premiers Crus are now priced out of reality for most people (I am “most people”), you can still enjoy Bordeaux wine that offers a taste of this uniqueness and at a value price that is shockingly friendly. If you agree that $13 to $16 is shockingly friendly, please read on. 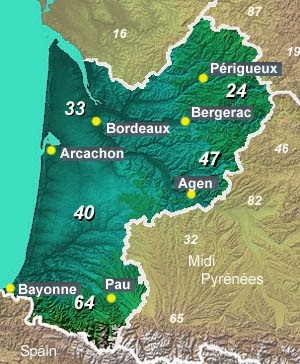 Chateau Pey La Tour is a Bordeaux Superieur from the Aquitance region (see map) about halfway between Bordeaux (the town) and St. Emillon. The Dourthe family, with a wine history dating back to 1840, bought Pey La Tour in 1990. But even in 1929, Roger and Andre Dourthe (4th generation) were focusing on terroir and quality improvement. Without getting into the tiresome debate on the value of point ratings, the fact that James Suckling gives this wine 88 points and Wine Enthusiast awards it 85/100 demonstrates that this wine has drawn attention. Now add that Chateau Pey La Tour has an average retail price of $15 and that you get to experience (perhaps for the first time) what a Bordeaux blend is and you have real value in the taste and the experience. Pey La Tour carries the “Bordeaux AOC” designation. While that is the lowest ranked classification a wine can be awarded and still enjoy vin de Bordeaux status, it has no pretentions toward being a Premiers Cru, nor does it come with the pretentious price of one. What it does purport to be is affordable, premium Bordeaux wine; something that has become a rarity the last forty years. Speaking of forty years, Chateau Pey La Tour is not a wine to cellar for that long (as are some). Nor would this wine improve much over time. Nonetheless, it should hold well to 2016 and it would be interesting to enjoy a few bottles over the years and see how they develop.